Doctors have stressful days at work when new on the job – just like the rest of us. But imagine if life and death are at stake like they are for internists and primary care physicians! Today’s guest is an internist who shares a great, 3-minute story about some craziness that went down during his third week at work as an internal medicine doctor. His name is Dr. Jeff Garland. He happens to be one of my best friends since we were 5 years old. Dr. Jeff has offices in Grayslake, Illinois and Highland Park, Illinois. Below he shares some important lessons learned from his Crazy Day experience and shares some good pointers for anyone looking for a medical career. 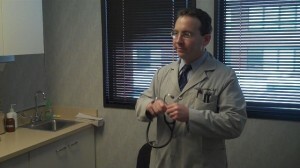 Don’t miss our full interview about internal medicine careers with Dr. Jeff. Also be sure to see our other posts on medical jobs and healthcare careers. For helpful book and website recommendations, visit our Medical Career Resources! Are you a doctor, a resident or in med school? If so, share your Crazy Day story below in the COMMENTS! Internal Medicine Physician Dr. Jeff Garland: I want to say that most of the time you can do your job and there’s a level of stress that is acceptable, but every once in a while, the stress could go way up. When I was in my 3rd week of practice over all, I had an old lady who came in with heartburn. I was just in my training, I said this is probably just heartburn, you can take Prilosec, but we should do an EKG because sometimes in women heart disease can be disguised as other types of symptoms, so we should do an EKG. My lab tech did the EKG and sent the lady home because she wasn’t really used to my style. I wanted to look at the EKG and review it, so the lady had left our office. I was in another room with another patient and I came out and the EKG showed a heart attack. Like an ongoing heart attack, like right now there’s a heart attack – and the lady was gone! So all of a sudden my heart started beating heavily, what am I going to do, it was my 2nd week and some lady is having a heart attack and I don’t know where she is! So I keep my composure, keep my compsure. I kept on calling their home and she wasn’t home. She went to the pharmacy to pick up the Prilosec. When she got home I told her to go to the hospital, she was having a heart attack, and the cardiologist saw her and they did an angiogram and there was really nothing to do but aspirin and medications. But I remember thinking oh my god, the world is ending! No one was that mad at me, they actually thanked me. This patient was one of my partner’s patients. I had only been practicing for 2 weeks and she actually switched to me. So I thought the whole world was ending and they actually liked me! So you never know what’s going to happen. So sometimes when you think you did the worst job, the patients think you did a good job. And sometimes when you did something very ordinary, they think you were great. And sometimes when you did what any other doctor would have done, they might be very angry because of a certain dynamic, that they’re unhappy with something that happened as far as an outcome and you really didn’t do anything that anyone else would have done but they’re upset. So I think the main thing is that patients will get upset sometimes and it’s important not to overreact. Be nice. If they’re being hostile, you want to be nice and not get your feathers ruffled. If someone’s attacking your staff or your partner, saying this doctor was bad because of this this and this, it’s important to keep your cool and listen and be compassionate and not overreact.